While the hues of the two prints are a bit different, the impression and registration of the print to the left are superior. The alignment of the texts -- overprinted with the same block on the unfurled banner and light green backgkround -- is also better on the print to the left. For another story about a husband who sends his wife packing with her lover, and his blessings, see TNS-1015 Gifted wife. The wooden cask of sake is painted with red lacquer. The lower part of the cask is wrapped in straw and bound with rope. On the side of the handle are the characters 拾八番, which are read either "jūhachiban" (number 18) or "ohako" (box) -- meaning that the sake itself, and its presentation, are special. "Jūhachiban" (十八番) signifies the performance of a polished hallmark act or forte -- apparently alluding to the 18 plays in the repertoire of the Ichikawa family of kabuki actors, as selected by Ichikawa Danjuro VII (1791-1859). 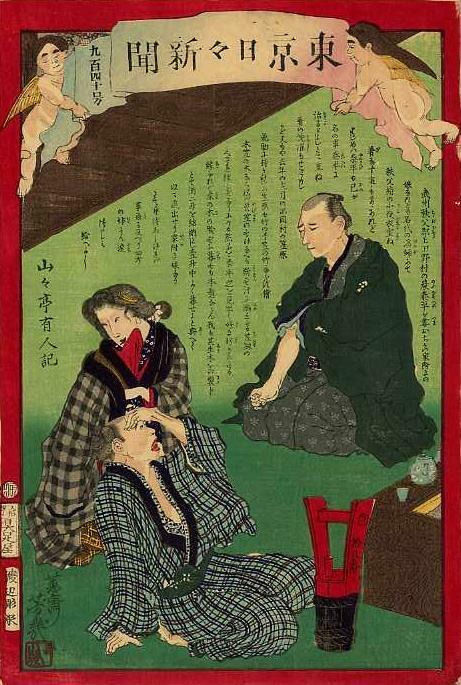 The term would have in vogue at the time this print was made, when Danjuro IX (1838-1903) was busy revitalizing kabuki. "Ohako" (御箱) would signify that the cask (hako) is special (o) because it contains something special -- as any repertoire or menu consists of the best works or entrees. "Juhachiban" is a fairly common name for a drinking establishments or restaurant. 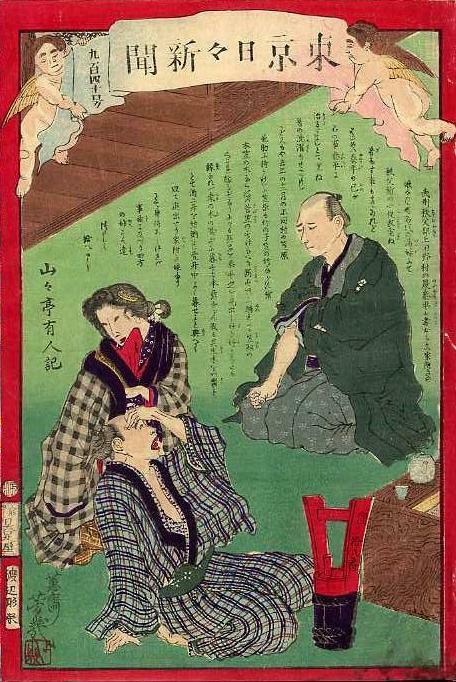 A rakugo performer's hallmark story, a karaoke singer's favorite song, or anyone's standard act at any kind of party, may be called their "juhachiban" or "ohako". The newspaper article is extremely short -- barely half the length of the story on the nishikie. The nishikie story is embellished with considerable wordplay that has been left untranslated here because it would not make sense without several pages of illumination. The newspaper article contains no wordplay whatever -- not even the single instance that has been translated and footnoted here, concerning the gift of sake (see below). Uedano village (上田野村 Uedanomura) and three other villages merged on 1 April 1889 to form Nakagawa village -- which joined other villages as Arakawa village on 11 February 1968 -- which joined Chichibu city from 1 April 2005.
a girl with a house reflects 家附きの娘 (ietsuki no musume), meaning that Yasuhei married into her family and took her family name as an adopted son and heir. The "house" refers as much to the "family" as to a physical home. Today weekly magazines sometimes feature single women, who are looking for husbands, and who "come with a house" -- usually a decent home, probably also an upscale car, and often a pedigree dog or two, and very likely a fashionable mother, if not also a father, and a whole set of likes and dislikes (interested men are advised to read the fine print). The women are typically only-child daughters who stand to inherit their family assets, and need a man to step into the breech, so to speak. nisho of sake . . . get along well issho reflects 酒二升 . . . 一升中よく暮せ (sake nishō . . . isshō naka yoku kurase). One sho (升 shō) is about 1.8 liters. One sho (一升 isshō) is also homophonous with "one life" (一生 isshō), meaning a "lifetime" or "throughout life". One sho is still the standard volume of the bottle of sake that people are likely to buy at a store. One sho contains 10 go (合 gō, 180 milliliters) and one-tenth of 1 to (斗 to, 18 liters). 1-go flasks of sake are served at eateries and drinking establishments, and 1-sho bottles of sake are sold by vending machine and at convenience stores. 1-to wooden casks of sake are still produced for special celebrations and offerings. Two sho of sake is still, today, part of the standard set of gifts exchanged between families at engagement and wedding ceremonies. The sake will usually be a more expensive kind, in 1-sho bottles, specially wrapped for such occasions. The equation of the "issho" of sake with the "issho" of a lifetime is typical of the sort of wordplay that figures in the association of the names of gifts with something auspicious.